Could this be a final farewell for Audi's naturally aspirated V10? 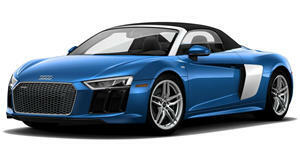 The Audi R8 V10 Spyder first made a splash at last year’s New York Auto Show. Over a year later, the German automaker has revealed the more potent Plus version which has the honor of being the fastest convertible Audi has ever made. Like its fixed-roof sibling, the Spyder Plus is powered by a 5.2-liter naturally aspirated V10 engine that produces 610 hp and 413 lb-ft of torque. Thanks to an extra 70 ponies under the hood, the Spyder Plus will race off the line from 0-60 mph in just 3.3 seconds - 0.3 seconds faster than the standard R8 V10 Spyder. This could be a final farewell for Audi’s naturally-aspirated V10 as turbocharged and more efficient hybrid powertrains become increasingly prevalent. Top speed in the Audi R8 V10 Spyder Plus has also been upped to 204 mph, making it 6 mph faster than the standard R8 Spyder. Such potent performance was achieved not only thanks to its power increase, but a significant weight reduction. Audi has trimmed some of the fat off the R8 Spyder for the Plus version, resulting in a dry weight of 1,587 kg – that’s 25 kg lighter than the regular R8 Spyder. Further distinguishing the dashing drop-top is a micrommata green finish exclusive to the R8 V10 Spyder Plus. The striking paint job is part of an optional package that also adds an anthracite gray single frame grille and black tailpipe covers for a more aggressive look. Inside, the all-black interior is lavished with Nappa leather, with green contrast stitching accents on the seats, center armrests, doors and floor mats to match the distinctive exterior. As standard, the R8 V10 Spyder Plus is equipped with ceramic brakes, bucket seats, and a large 12.3-inch Audi Virtual Cockpit displaying vital information. It can also be configured to display a special performance view that focuses on the rev counter, and also serves as a gear shift indicator. Audi is taking orders for the R8 V10 Spyder Plus with prices starting at 207,500 Euros in Germany and deliveries commencing towards the end of the summer. Price details haven’t been detailed for the US, but expect it to be more expensive than the standard R8 Spyder which starts at $175,000.